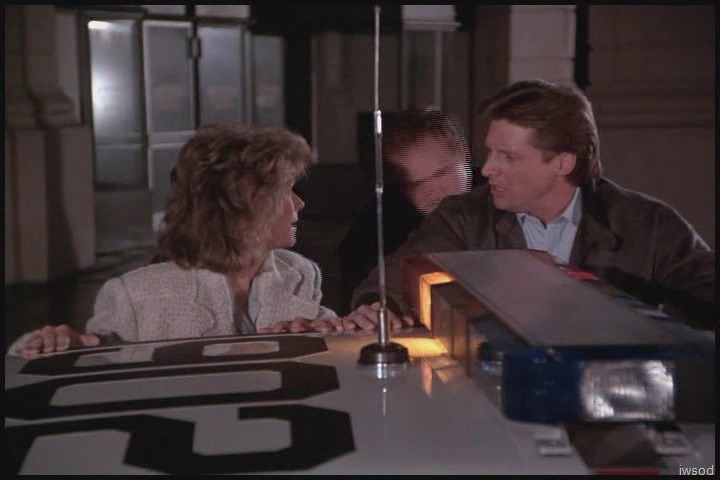 11/19 Season Three, Episode 13: One Bear Dances the Other Doesn’t – Scarecrow and Mrs King | "Just walk with me.."
So we left Amanda watching Dotty get driven off in the back of a patrol car..
Amanda: The police have my mother. Lee: I hope it is the police. Amanda: She left it inside…. BB totally nails this moment.. Lee looks off in the distance, knowing this is really bad.. 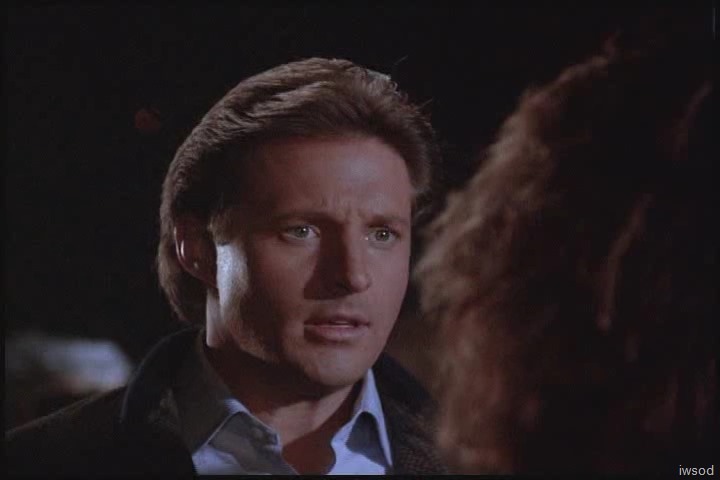 He looks back at Amanda.. IMHO thinking ohhh nooo I have to tell Amanda Dotty is in a whole lot of trouble. …Well look we’ll just have to go down to the police station and bail my mother out. Lee: I hope they really are the police…. 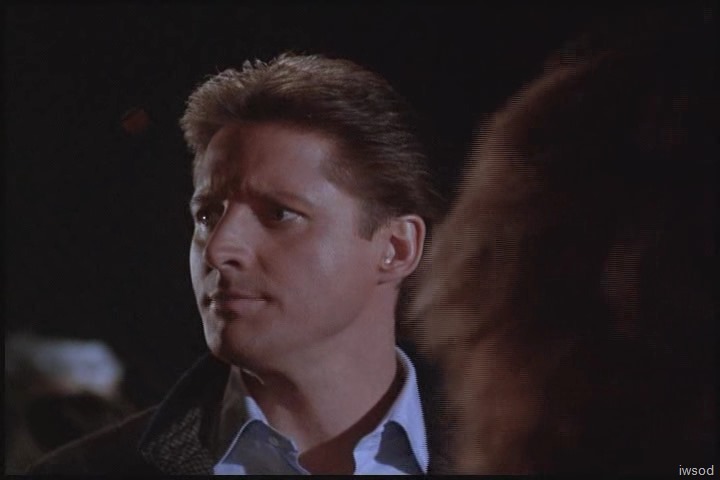 …My informant Jerry? ….is dead. Amanda lets out a big breath.. shocking news..
if only Amanda had known this – she could have followed the police car.. Considering what’s on the line here, Amanda is being quite brave here.. she keeps it together..
Lee and Amanda seem to linger.. and look off into the distance as the scene ends here.. umm why are they not running for the car?! Anyone interested in creating some more commercial breaks? I’d be happy to insert them! We cut to Lee and Amanda driving in the Vette- Oh I see.. commercial break- then car! Amanda: Aw it’s no use. They could have turned off anywhere. 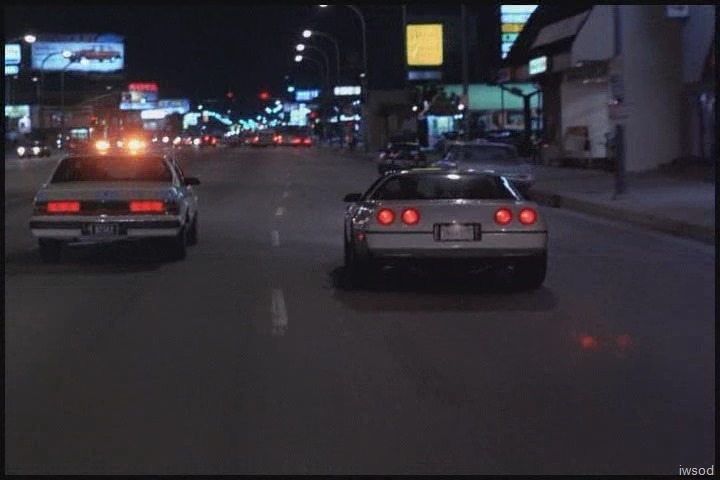 Then, driving along, they see a cop car appear ahead of them – they turn their lights on..
Lee: Oh yeah? Look up ahead.! 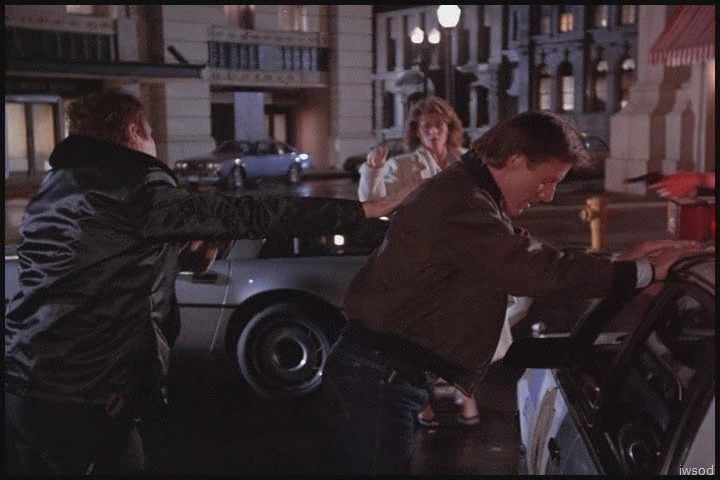 ( Lee points out the cop car) ….Hold on I’m cutting this guy off. 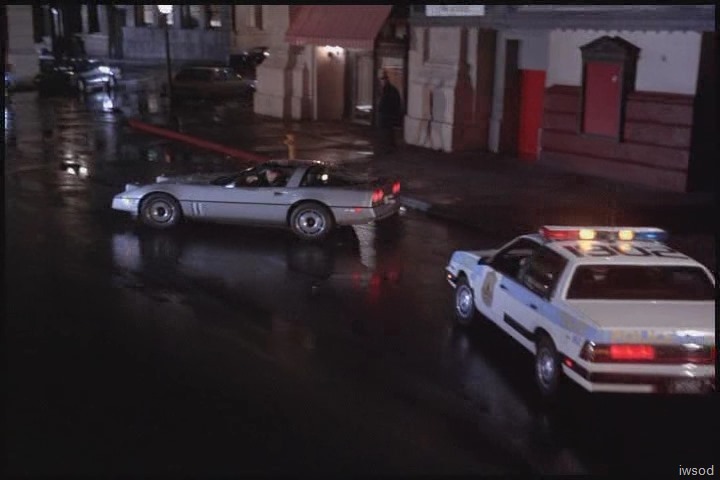 Lee cuts off the cop car, turning the Corvette in front of the car. 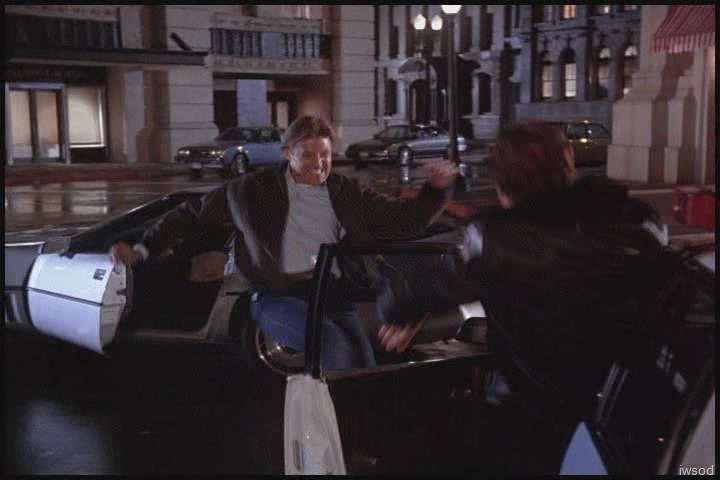 Lee jumps out of the car and kicks one of the cop’s door closed on him..
Other Cop: All right! Hold it right there! Grab some sky NOW! Hands on the roof, feet back. Amanda joins Lee up against the cop car. 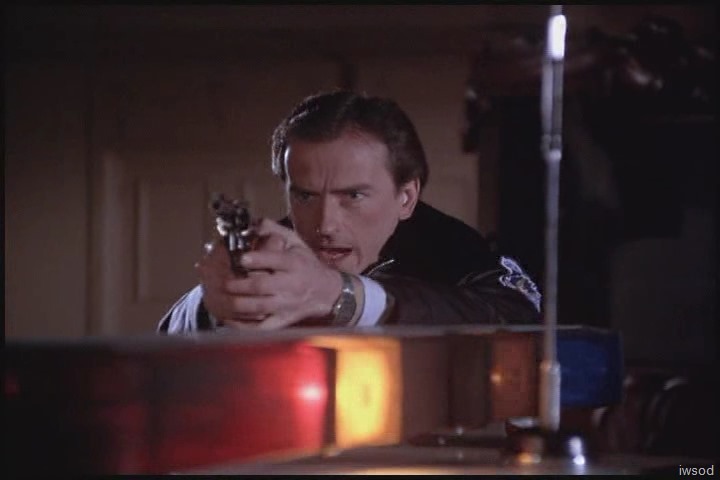 The beaten up cop takes Lee’s gun from him. 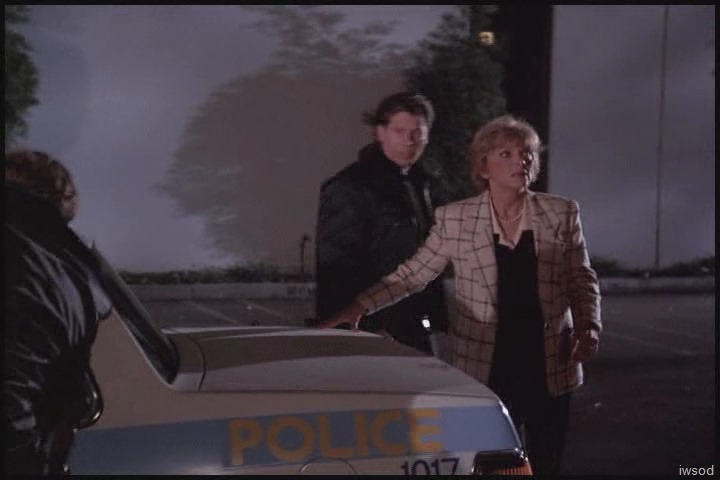 Amanda: These aren’t the same policemen, the car that picked up my mother was 1017…. [LOL Lee has that scarecrow look on his face..
….Who are we? Bonnie and Clyde??? Ahh yes.. the iconic little moment.. I’m sure this featured front and centre in the adverts! Block your ears err I mean close your eyes – I find this whole set up meh! worse than meh.. It all seems very contrived to me.. they didn’t rush after Dotty when it was so serious and all.. Amanda didn’t tell Lee what cop car number to look for.. and Lee just rushes in and starts punching one cop while the other is free to aim a gun at him? What the heck??!!! Why didn’t he pull his gun on them? 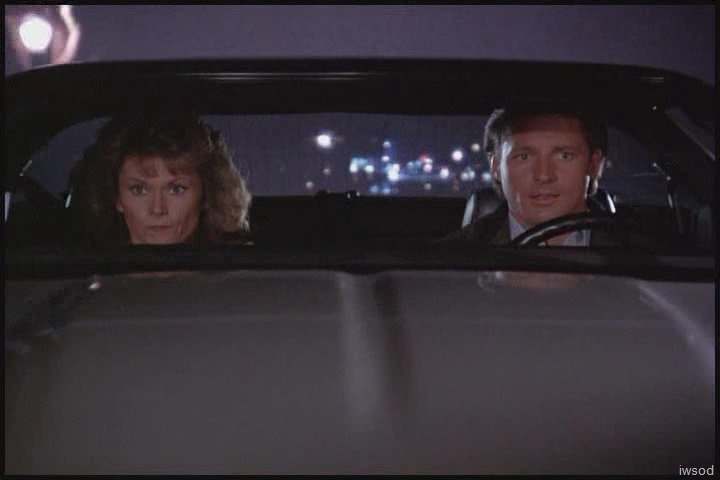 or umm check if Dotty and Zernoff are sitting on the back seat as you ‘drive past to cut them off?’ and .. what’s with the time machine that sends them to a warner bros back lot?! okay okay.. this rant has gotten out of control.. I hear ya! Were Bonnie and Clyde a romantic couple or just partners in crime? if it’s the former, I could like this a little more. but.. it all just seems like one big set up for this gag and a good advert moment..
Ohhh I feel very naughty criticising such a well known moment.. when I haven’t been able to publish many posts lately.. and then when I do I have a rant?! gah!!! so sorry guys! On the upside, I thought concerned Lee at telling Amanda her mother has been driven away by killers masquerading as cops looked adorable! Such a great view of his eyes.. swoony..
Maybe Lee just rushed in like that because he panicked.. and it’s Dotty in danger.. but.. well.. that doesn’t really look very good for our superspy no? 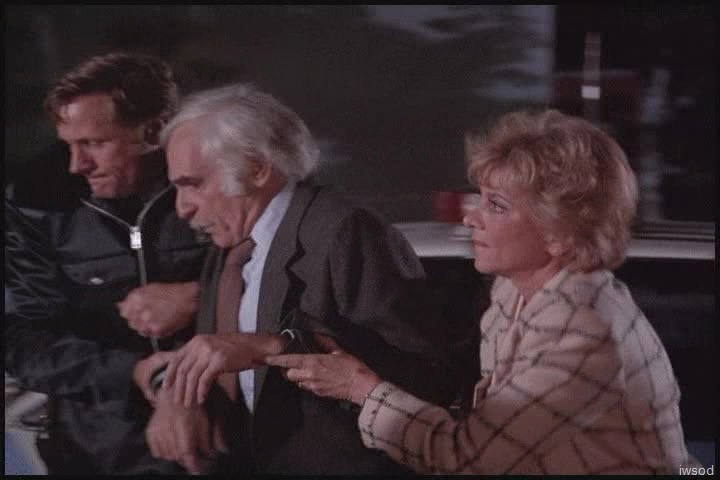 plus, Amanda cracking a gag like this when her mother is in heaps of danger? Just seems strange to me.. anything else I can find wrong with this? well.. give me time I could come up with a few more.. man I’m soooo narky about this scene – so sorry! In the interests of not ending on a sour note.. I’ll cover this next scene! We see the cop car pull up at a big building..
It’s the fake cops with Dotty and Zernoff.. uh oh..
Dotty looks up and sees a large billboard with Mr. Marshmallow. Dotty: This doesn’t look like a police station to me. 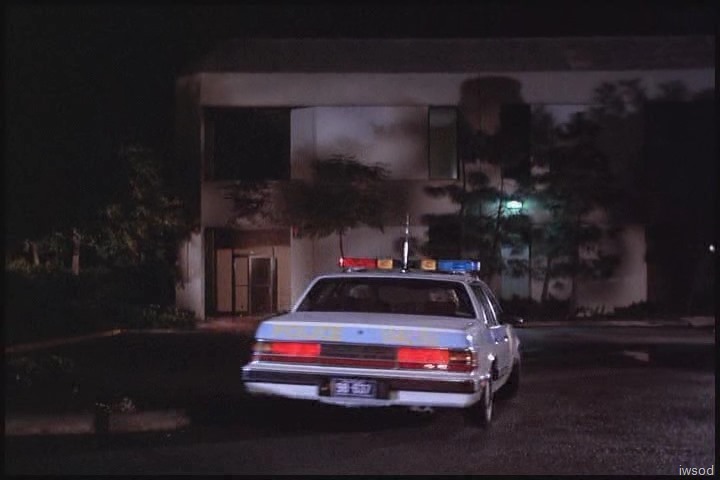 A fake cop and Dotty help Zernoff walk into the building. 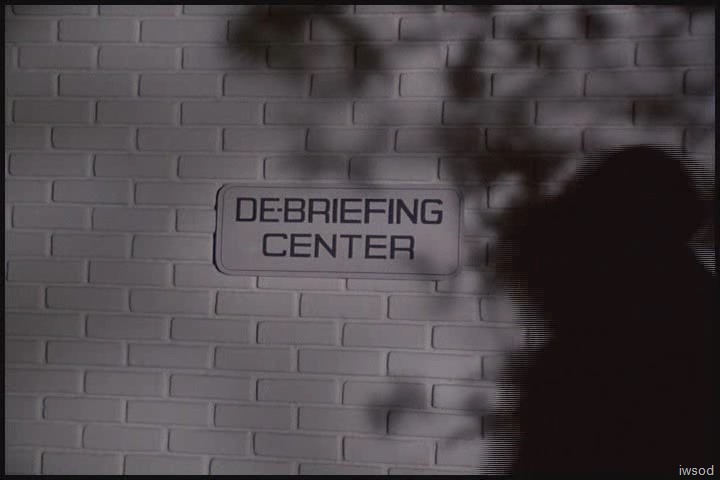 This is a de-briefing center? Okay guys.. I shall finish here.. I hope you are all well and apologies the posts are coming slower.. Life (and my eyes) have been protesting of late.. Byee for now! Hi everyone, I have been missing this blog so much. Real life was keeping me at bay. Now I get to do some binge reading and binge commenting. I love how Lee handles himself with Amanda here. He is concerned and patient and knows how difficult this has got to be for Amanda. Even when Amanda says it’s no use and seems a bit defeated and wants to give up, Lee keeps going. With that being said I have no clue as to why he would do what he did in regards to go at the police like that. I can understand him having been a hothead, shoot first, ask questions later kind of guy, but he has grown so much since then. It just doesn’t fit. I don’t get the Bonnie and Clyde reference either. Bonnie and Clyde tried to avoid the police for the most part. And while they were a couple they were ambushed and died a horrible death. Don’t get that. Also, debrief is not a hyphenated word, not sure why it is so on the sign. That should have been a clue to Dotty. Agree that that marshmallow man is kind of creepy. Amanda and Dotty do love those marshmallows don’t they. I wish I’d seen the bonnie and clyde moment as the show laughing at itself – really! Your comment made me ponder.. why don’t I find the moment hilarious farce? I’m trying to think of other moments that have been farcically funny.. I think I tend to like less Lee and Amanda farce – the exception being when Amanda was drugged and so it wasn’t really Amanda 😉 I did find that funny! But I think I prefer the farce to come from the plot, secondary characters or guest actors.. not from Lee or Amanda – thus.. Dotty finding Amanda spying on her and finding it sweet is flippin hilarious to me! Amanda is not being ridiculous, it just appears that way because Dotty doesn’t know the whole story.. so Dottys reaction is even more funny..
Ahhh what kills humour more than actually analysing it??!!! eeeeek… iwsod has totally analysed it! don’t mind me..
whoooo raffie when we get to the follow up scene whatever it is – you must tell me!!!!! tune out baddie scripting? that’s an interesting technique there! May I ask… Who else feels this way? Anyone be happy to completely skip all the baddie scenes on JWWM? you’ve got me curious now..
I’ll share my thoughts on this after a time – because I don’t want to suggest to people an answer, I’d really like to hear your honest views everyone! Okay gotta get on with my day here – byeeeee!!! Keep the baddie stuff in – it’s usually amusing if nothing else. Oh, please don’t skip the baddie scenes. I learn soooooo much by reading JWWM’s baddie write-ups! I can’t believe the number of times I read something here and have positively no recollection of it at all, in spite of me having watched every episode umpteen times. Oh My Heck! Your commercial break is absolutely cracking me up! I find it interesting that Amanda says that “We’ll” have to go bail my mother out. Slip of the tongue? Surely she can’t let Dotty meet or see Lee? Or was she referring to the “royal” we? Nice commercial, iwsod! 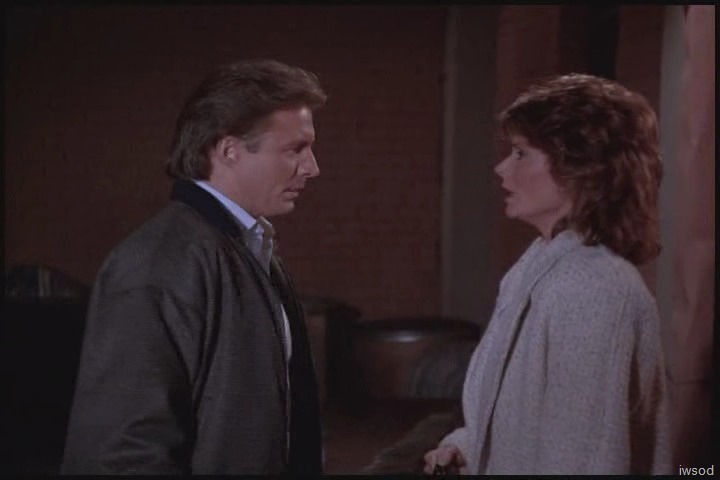 And I completely agree with you on your rant – this scene is kinda ridiculous! It’s as if both their brains have been rendered useless. Maybe Lee just doesn’t want to have to explain that Amanda’s mother is involved now…I’m guess neither he nor Francine have filled Billy in on that tidbit. I can see Billy loving that. I don’t remember if this scene was used as a teaser for the episode back when it originally aired, but it probably was. Have you noticed how many things have been coming in twos? I have not! What have you noticed? Two other defectors, two guys working together at the Muscovy…what else? I can’t resist Jestress.. The title, for two! Loved your evil laugh Jestress.. your comment had me giggling away – imagining you playing the with the light switch! tee hee! You’re right, we shouldn’t neglect the other numbers. Five boxes of Blue Jay candy! Ah-ah-ah! Oh, I almost forgot that Amanda has two boys. Ah-ah-ah! Love it, Jestress! No need to slink away though – we’re all taking turns with that light switch! That was awesome!!! I feel like going on a walk to count the flowers… Three beautiful pink flowers… 4 happy yellow flowers. and 2 zooming leetle humming birds. Ah-ah-ah. And the beautiful sunny day suddenly goes dark and it begins to thunder and lightening. awh thanks for letting me know you enjoyed the ad break 🙂 made my day! 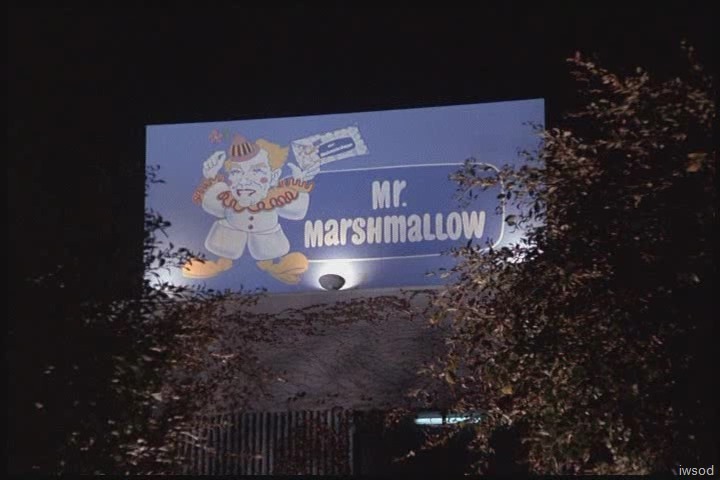 Mr Marshmallow is every bit as creepy as the Marvelous Marvin’s hamburger mascot. Agree with your rant Iwsod, S3 Lee does some silly things but maybe we should just put it all down to personal concern for Dotty getting in the way of his professionalism. He’s going to have to work on that. I think Lee’s hotheatedness and impulsivity are very much in keeping with what we know of him. The good thing here is that, as kiwismh says, his silly behaviour seems to be a result of his concern for Dotty (and/or for Amanda) which makes it more palatable than his previous fits of temper. Hiya Learjet – hi everyone! I can get on board with Lee being a bit hotheaded from time to time.. but for me – this behaviour is plain dumb. He’s lucky he doesn’t get himself shot. For me, it’s reckless and unprofessional.. even in wizard when he was half out of his mind he kept his head and took some precautions.. Meh. If this behaviour is Lee in love – Lee needs to quit the spy biz! whooooo is that a controversial thing to say??!! 🙂 haaa!! lol I’ll quit ranting about it now I promise! I’m crazy about Dotty waving out of the police car – that is such an awesome moment!!! Possibly one of my fave Dotty moments so far! I agree that Lee is behaving like an idiot here. Actually, I think his temper is a big problem in his spyworthiness (and in his personal life! ), and has caused problems before this. I just think that his temper is more motivated from caring about people now, than in early seasons when it wasn’t personally motivated. I think he needed a partner who calms him to operate effectively as an operative ( 😀 ) and help him to think before he acts. Amanda does that to a certain extent at work (when there is no personal connection to the work) but he cares about her too much so he instead loses it in matters concerning her. Indeed.. no change of mind needed.. and no change of mind intended 🙂 tee hee.. Keen observation, learjet – and one I think Billy has noticed from the get go. Amanda is good for Lee! Whether he liked/likes it or not! Not that minds should be changed, but it is moments like this when my brain becomes a contortionist. The things I do to protect the integrity of these characters that I love. So, I am thinking that Lee’s behavior here is exactly why he was and will be so slow about going forward. When he cares for people it freaks him out and he loses his edge. Maybe it is a pendulum swing for him and he will settle down as he gets further along in this connectedness business. Maybe he is also freaking out a bit because this is a mother, the mother of someone he loves. Maybe it taps into his own loss issues? Ok, contortions of the brain, but I have to make this work somehow. The Bonnie and Clyde comment… I believe Bonnie and Clyde were a couple. But I wonder if Amanda is grappling with what a relationship with Lee Stetson and the life that would create for both of the would look like. I kind of wonder if it isn’t that kind of theme that is also reflected in all of the shots through the wind shield of the car? Just a thought. And one more thought on episode order. Here is another time when Lee loses his objectivity. 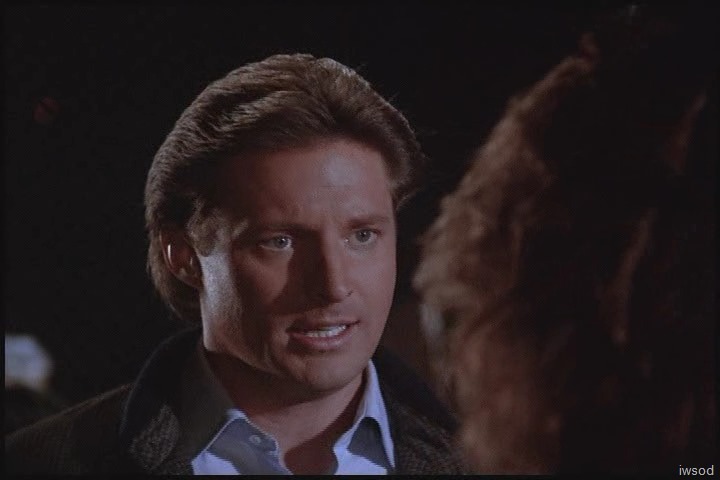 I could see Billy needing to remind him of his priorities in FFFT after a moment like this. OK, time to stretch out my brain, enough contortions for now. Oh phew.. glad it’s not just me!! Good call! Mr Marshmallow does look quite evil! 🙂 haaa love it! I wondered if this is a KJ ad lib (about Bonnie and Clyde) – I checked: it is in the script. 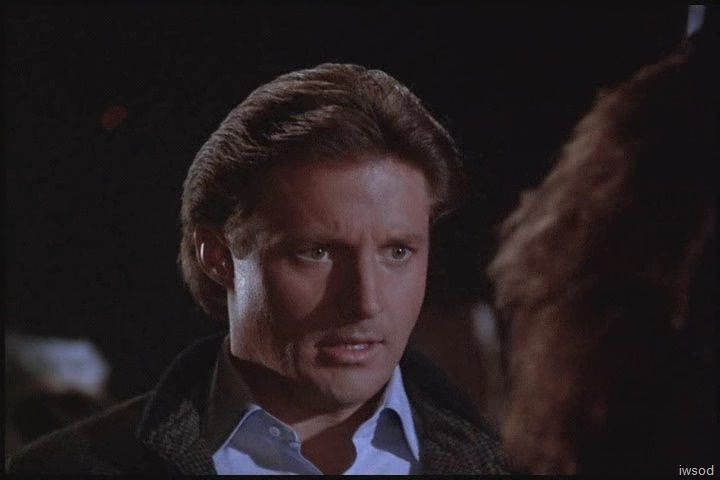 I see this as a link to other comments that have been made in the past (Amanda about Lee thinking he’s Percy Mason, and I think Dotty about Efraim Zimbalist Jnr) to TV detectives. But now the romantic,criminal partners has been added to the mix. Thanks Jilly for clarifying that.. they died? ummm yeah.. maybe it doesn’t redeem things lol!! haaaa! !